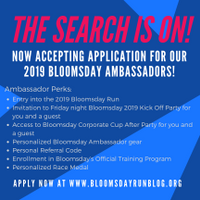 The Lilac Bloomsday Association is looking for five runners to be 2019 Bloomsday Ambassadors. The 2019 Bloomsday Ambassadors will tell the world all about their experience with Bloomsday on social media and personal blogs. The selected ambassadors will be notified by Friday, November 9, and introduced in the Thursday, November 15, 2018 edition of The Rundown, Bloomsday’s monthly e-newsletter. Questions regarding this process can be directed to PR/Communications Director Emilie Laakso, emilie@bloomsdayrun.org, phone (509) 838-1579, ext. 13.